School Education – Guidelines for conducting Telangana State Teacher Eligibility Test (TS-TET) under the Right of Children to Free and Compulsory Education Act (RTE), 2009 – Orders – Issued. 1) RTE Act-2009 of Ministry of Law and Justice, Govt. of India, dt.27.08.2009. 3) NCTE, Guidelines for conduct of TET communicated vide Lr.No.76- 4/2010/Acad,dt.11.2.2011. 4) NCTE Gazette Notification, dt.29.7.2011. 5) G.O.Ms.No.51, SE (Genl.) Dept., dt.16.4.2011. 6) G.O.Ms.No.70, SE (Genl.) Dept., dt.06.6.2011. 7) G.O.Ms.No.102, Education (SE.Genl.II) Dept., dt.28.7.2011. 8) G.O.Ms.No.256, Finance(SMPC-I) Dept., dt.8.12.2011. 9) G.O.Ms.No.4, Edn. (Ser.II) Dept., dt.09.01.2012. 11) From the Director, SCERT & Convenor TET, Telangana Lr.Rc.No.22/TSTET/2015, dated:08.12.2015. • It would bring National Standards and benchmark of Teacher quality in the recruitment process. • It would induce Teacher Education Institutions and students from these Institutions to further improve their performance standards. • It would send a positive signal to all the stakeholders that the Government lays special emphasis on Teacher quality. (i) Intermediate / Senior Secondary (or its equivalent) with at least 50% marks. 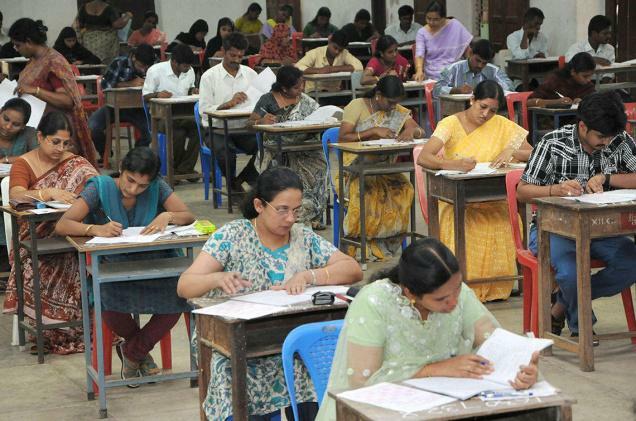 However in case of SC/ ST/ BC/ Differently Abled candidates, the minimum marks shall be 45%. AND pass in 2 - year Diploma in Elementary Education / 4-year Bachelor of Elementary Education (B.El.Ed.) / 2 - year Diploma in Education (Special Education). (i) B.A./B.Sc./B.Com., with at least 50% marks. In case of SC/ST/BC/Differently Abled candidates, the minimum marks shall be 45%. AND pass in Bachelor of Education (B.Ed) course / Bachelor of Education (B.Ed -Special Education). (ii) B.A./B.Sc./B.Com., with at least 50% marks. In respect of SC/ ST/ BC/ Differently Abled candidates, the minimum marks shall be 40%. AND pass in Bachelor of Education (B.Ed) course / Bachelor of Education (B.Ed -Special Education) in case of the candidates who have passed or admitted to B.Ed., course prior to issue of these guidelines. (iii) 4-year B.A.Ed/B.Sc.Ed., with at least 50% marks, in case of SC/ ST/ BC/ Differently Abled candidates, the minimum marks shall be 45%. Director SCERT - Nodal Officer & Ex-Officio Director TET. • A separate account shall be opened for the purpose of TET Funds and the Accounts shall be audited every year by a Chartered Accountant. • The Director, SCERT – Nodal Officer & Ex-Officio Director, TET is authorized to conduct TET in an effective manner assisted by field functionaries viz. RJDSEs, DEOs, etc. He/ She shall take up pre and post examination activities scrupulously as per the Guidelines and Schedule for every TET decided by the TET Committee. He/ She shall formulate a detailed procedure and lay down instructions for conducting TET. The DEO shall be the Officer responsible to conduct TET in the Districts under the overall supervision of the District Collectors. P.G. College/ College of Education/ D.Ed College/ Engineering College/ Polytechnic/ ITI can be identified by DEO with the approval of District Collector for constituting an Exam Centre for TET. X. Language Pandit candidates have to choose the Language of their study in Pandit Training concerned under Language-I of TET Paper-II. (b)The Director, SCERT, Telangana shall issue Memos/ Pass Certificates to the candidates. Electronically generated with adequate security features to avoid any kind of malpractice. 4. The Director of School Education, Telangana, Hyderabad and the Director, SCERT Telangana, Hyd., shall take necessary action accordingly. RANJEEV R. ACHARYA, PRINCIPAL SECRETARY TO GOVERNMENT. The Director of School Education, Telangana, Hyderabad. The Director, SCERT, Telangana, Hyd.